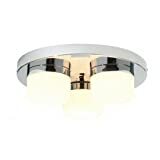 Beautiful Modern Bathroom Ceiling Light. In Chrome And Square Frosted Glass. 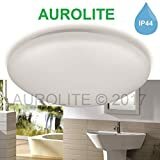 IP44 Rated For Bathroom Use in Zone 2 But Also Perfect For Other Rooms. Complete with frosted and transparent glass plate with four small moulded glass insets. 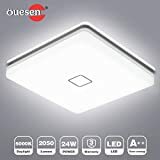 Square LED Bathroom Ceiling Light: This beautiful LED light creates a comfortable and pleasant lighting in your bathroom to help you enjoy a refreshing shower or bath. 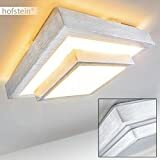 The designer ceiling light is made of metal and plastic in a beautiful colour white. 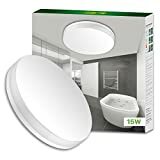 Bathroom LED Bulb: This LED light for ceiling comes with a power consumption of 12 watts per light bulb and lights up your entire room or bathroom beautifully. 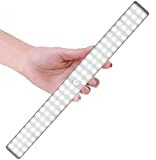 Size of Bathroom Ceiling Light: Comes in perfect size of 27 cm in length, 27cm in width and a height of 10 cm. 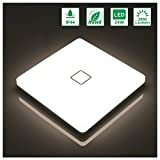 This square LED light can be also used in dining room, kitchen, and hallway. Save Energy: Replaces 100W traditional incandescent light, saving energy over 85%. 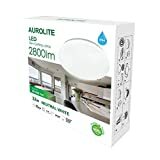 Brightness: With 1250 lumens and over 80 CRI, the light is bright enough, which can fit room with 9~12 ㎡ . Waterproof: Comes with water resistance rating IP54, protecting from water splash. 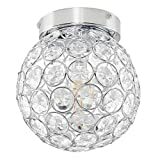 Concise Design: the appearance is elegant, neat, and concise, for different lighting decoration style. Application: Can be applied for various scenes lighting, like, bedroom, dining hall, lobby, corridor, balcony, etc. 1. Easy and new installation design. 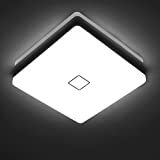 Innovative tray design makes it easier to install than traditional ceiling lights. Complete all in 3 steps. 2. Energy sufficient and saving. Compared with traditional incandescent lights, it saves energy over 85%. 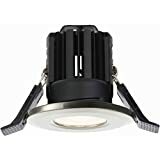 Led lights driver make it stable and reliable. 3. Super Bright. Built with 75 high quality LEDs, CRI 80+ and the Lumen is 1050 Lumen. 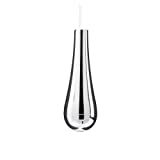 High quality light shade ensures transmission of light in full. 4. Safety guaranteed and long lifespan. CE, RoSH certificated. The shade will not fade and keeps white for much longer. 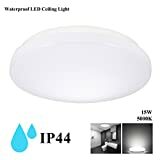 IP44 waterproof for Bathroom. 5. Light up the dark and light up the night. 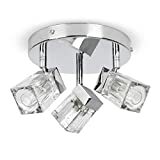 Contemporary and stylish chrome plated metal bathroom ceiling light fitting. Complete with high quality frosted glass diffuser and clear halo glass surround. Dimensions - Height: 10cm, Diameter: 30cm. Requires 1 x 40watt SES (E14 ) bulb - not included. 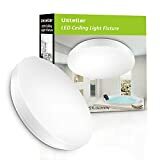 Low energy and LED bulbs may be used. 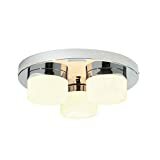 Beautiful Modern Bathroom Ceiling Light. In Chrome And Opal Glass. Operating voltage - 230V / 240V. IP20 Rated. Splash proof. Suitable for bathroom zones 3. IP44 RATED : which means protect against splash water from all directions. 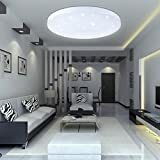 ClayLight waterproof bath lighting ceiling equiped with a O-RING(which is a Lighting waterproof apron), espicially designed for Bathroom and Balcony, Kitchen, Hallway. EFFICIENT & ENERGY SAVING: Power supply using high-quality constant current power supply isolation driver, high reliability, energy-saving effect is obvious. LIGHT BRIGHTER THAN OTHERS. CRI(color-rendering index) over 85, and more than 132 pcs LED light beads is evenly distributed on the whole light board. 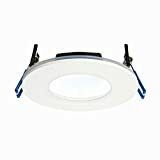 Espicially, the drive is hided under the LED light board so that there are no shade on the light shade.So it is brighter than other ordinary lights. 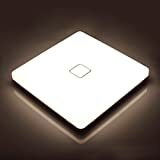 The material of our professional ceiling light cover is new PC & PMMA, of which transmittance is more than Acrylic material. 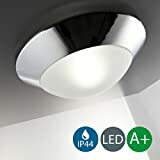 So the light transmittance is higher than other LED ceiling light. 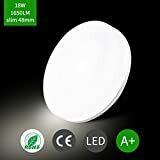 QUALITY WARRANTY: The base plate was made of high-quality PC material.Our LED ceiling light do not need earth wire for installing because PC material is perfect insulated. 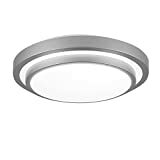 All of ClayLight LED ceiling lights come with 24-Month Warranty, 30 days for free replacement. If you have any question please feel free to CONTACT US before you return it. Package containing update: Add two WIRING CAPS in the package. 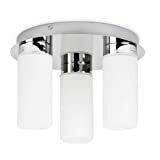 Modern and compact bathroom ceiling light fitting in a polished chrome finish. Complete with three frosted tubular glass shade diffusers. Dimensions - Height: 14cm, Diameter: 23cm. 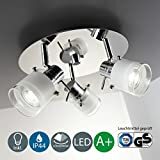 Requires 3 x 33watt low energy 240v G9 bulbs (not included). 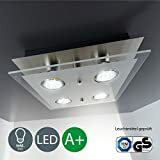 LED G9 bulbs may be used if desired. 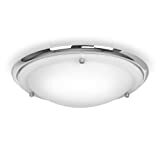 Contemporary and stylish square bathroom ceiling light fitting with brushed chrome back plate. Complete with transparent glass plate with four sets of glass pyramids within a frosted square surround. 【Smarter Motion Sensor Modes for Security】Lifetime Warranty!The new version Mpow Solar Lights now has Three Intelligent Modes for your choice: strong long light mode, dim light sensor mode, strong light sensor mode. You can choose the perfect mode according to your diverse needs. 【Ultra Bright LED Solar Lights】 Mpow Security Solar Light far brighter than other similar lights. 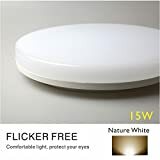 It provides max-brightness illumination for security and safety protection for your property all night. 【High Efficiency Solar Panel & Fast Charging】 The LED solar panel has been updated to a laminate version which is more efficient at converting the sunlight into battery charging power. 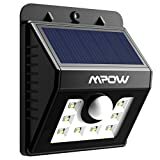 Mpow solar powered lights also has a life expectancy three times longer than the original epoxy board design. 【Improved Waterproofness】 As this solar light is designed to be used outdoors it may be exposed to rain. To improve the product life, there are now two separate seals between the internals and the back case. Therefore the Mpow Security light is more durable and weatherproof than ever before. 【Easy Operation】 Just hang it on anywhere you need it to be, or use screws to mount the device (recommend). 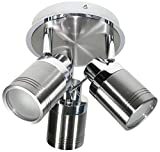 Another updated part of this solar motion security light is the ON/OFF button on the back, which lets you get rid of those similar solar lights which needs to turn on/off with the help of key pins. PLEASE NOTE: If the sunlight is not strong, the battery may not be fully charged, so the lighting time and brightness will compromise. 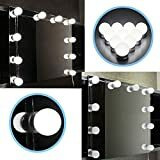 351.5cm light kit in full length ( Not include the adapter and dimmer), can be adjusted the length for your needs freely to keep your vanity makeup set beautiful and neat. 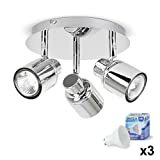 The extra bulbs can be cut off. 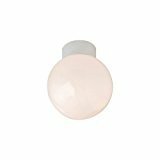 10 LED bulbs produce a soft and bright glow. 6,000K white light closely simulates natural sunlight, providing a professional color-correct lighting for makeup. Securely attach on a mirror, mirror frame or wall with the supplied double-sided tapes in a few minutes, and plug and play with the included 12V power supply. 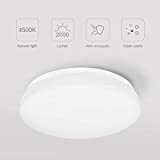 Turn lights on/off and adjust brightness whenever you want with the smart touch dimmer; memory function means the lights will always stay on your desired level of brightness when it is switched on. 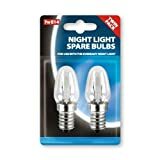 Never have to replace the bulbs. No wiring or assembly is required. 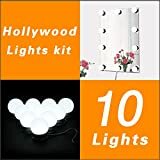 Light kit only, mirror not included. Powered by water - No charging. No batteries. No plugs. This clever light attaches to your faucet and creates its own power from the water flowing through it. It's your very own little hydroelectric power generator that creates a colourful waterfall every time you use it. 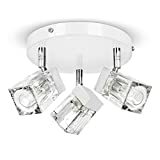 Safe and durable - Made with ABS (same as LEGOs) and other high quality materials, this light won't rust or corrode. The electrical components are carefully and securely separated from parts that touch water and the LEDs are rated to last 50,000 hours. 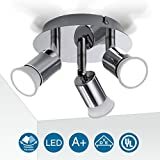 Fits standard threads & easy to install - If your faucet has standard round thread (both female or male), this will work for you. We've included an adapter for male threads. To install, simply take it out of the box, remove your existing cap, and screw into place. 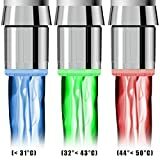 NOTE: The product is suitable only for round water outlets. If your tap is with female thread, then the diameter of the thread should be 24mm. If your tap has male thread, then the diameter of the thread should be 22mm. 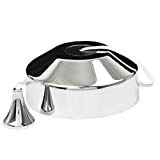 Great for families, kids - Whether you use this in a classroom, kitchen, or bathroom, it's sure to make an impression. The colours are bright and changes depending on the temperature of the water flowing through it. Perfect as a safety precaution for small kids and babies. Great gift for boys and girls alike. Temperature sensitive - For cool water (less than 31°C), this light glows blue. For warm water (32 to 43°C), it shines green. For hot water (44 to 50°C), you'll see red light. For water that's over 46°C, it'll blink red as a warning that the water is very hot.